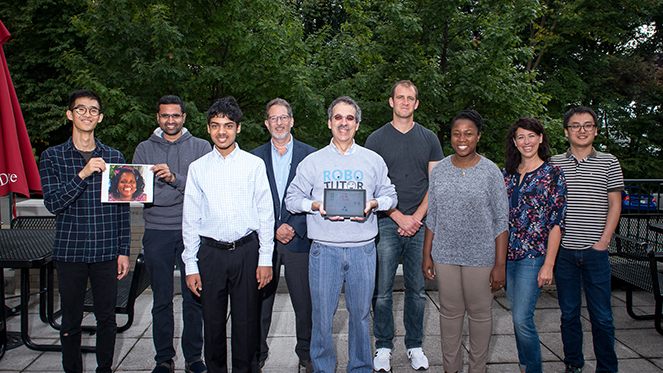 RoboTutor LLC, a Carnegie Mellon spinoff created by Professor Jack Mostow, was named one of five Global Learning XPRIZE finalists for its RoboTutor software, educational technology that teaches children basic math and reading skills. The XPRIZE competition is attempting to address the acute shortage of teachers in developing countries by funding an international competition to create open-source Android tablet apps that enable children ages 7-10. The goal is to enable young children to learn basic reading, writing and math skills without requiring adult assistance. Each finalist team receives $1 million. XPRIZE will now conduct an independent 15-month, large-scale study to field-test the finalists’ Swahili apps, pre- and post-testing thousands of children in nearly 200 Tanzanian villages on literacy and numeracy. A $10 million grand prize will be awarded to the team whose app achieves the highest learning gains. The educational apps were created in both English and Swahili and have the potential to help an estimated 250 million children around the world who cannot read, write or do fundamental arithmetic. Mostow is a professor emeritus in the School of Computer Science’s Robotics Institute whose research focuses on applying artificial intelligence to educational technology, particularly for teaching children to read. The RoboTutor software is based on scientific learning principles in order to engage students so that they learn the material and can then use it in other contexts. It is powered by advanced technologies, including speech and handwriting recognition, facial analysis and machine learning. It collects data from its interactions with children both to enable cognitive tutors to adapt to individual students and to enable innovative data mining tools to continuously evaluate and refine its design and functionality. RoboTutor LLC licensed certain CMU technology and is using it in the team’s competition entry. The RoboTutor technology leverages many assets, including its precursor, Mostow’s Project LISTEN. In that project, an automated Reading Tutor helped children learn to read by listening as they read aloud. The tutor would correct their errors, provide help with hard words and assess their progress. “It’s hard to put into words to explain the gratifying feeling knowing that your career’s work, which has helped thousands of children so far, could now potentially change the lives of millions—even billions—of children. XPRIZE and the RoboTutor team have given me the opportunity of a lifetime,” Mostow said. The RoboTutor software includes hundreds of activities that address four content areas—reading and writing, numbers and math, comprehension and shapes. Another distinguishing feature is a data-driven design process that helps it integrate with local cultures. The RoboTutor team consists of over 100 CMU students and faculty as well as other experts and students from around the globe, including CMU’s Amy Ogan, assistant processor in the Human-Computer Interaction Institute (HCII) and Judith Uchidiuno, a Ph.D. student in HCII; Leonora Kivuva, an instructor in the University of Pittsburgh’s African Studies Program; and 15 year-old Vishnu Rajan Tejus, who was the first to join the team and is Chief Technology Officer (CTO) of RoboTutor. To become a finalist and win a $1 million prize, Mostow and the RoboTutor team beat out nearly 200 teams from 40 different countries. The other finalists are CCI (U.S.), Chimple (India), Enuma’s Kitkit (U.S.) and onebillion (United Kingdom). Watch a video of Mostow explaining RoboTutor and the next steps in the XPRIZE competition. First picture above is of the RoboTutor team. Second picture above are CMU Professors Jack Mostow and Amy Ogan. Third picture above is CMU Professor Jack Mostow with CMU student Vishnu Rajan Tejus.